In 2016 there were more than 1,000 drug treatment cases where cocaine was the main substance reported. 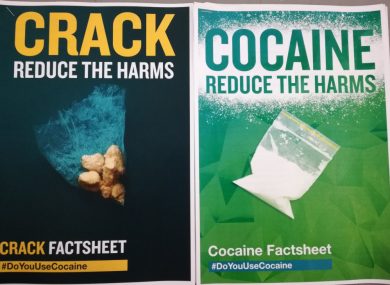 THE HSE HAS launched a new campaign to tackle cocaine and crack cocaine use in the country. There has been a significant increase in the use of crack cocaine in Dublin city centre in particular according to service providers. The campaign launched today focuses on giving people practical advice on how to reduce the harm to themselves when they are using cocaine. Minister for Health Promotion and the National Drugs Strategy Catherine Byrne said this is a health warning “rather than preaching to people” who use drugs. “It’s important to say that it’s always safer not to use illegal drugs and we’d advise people not to, but we also need to be pragmatic and recognise that some people will use drugs,” she said. Between 2010 and 2015, there was a 110% increase in cocaine-related deaths, from 21 to 44. Irish data shows an increase in cocaine-related deaths during the economic boom years and a decrease following the recessionary period. There has been an increase however in cocaine prevalence since 2013, particularly among young men. Dr Eamon Keenan, clinical lead for HSE addiction services said he is seeing a return to “pre-bust levels” of cocaine use across the county. “Since the economy started to recover people have more disposable income in their pockets and they’re using cocaine,” he told TheJournal.ie at the launch. The way it’s portrayed in movies and books, it’s not associated with squalor, it’s not associated with lower socio-economic groups, it’s associated with high-end parties, with business, bankers all this kind of thing. People snorting it through rolled $100 bills and this is the image associated with cocaine but the reality is the health problems associated with it are very significant. Keenan said the danger associated with mixing cocaine and alcohol is not something many people would be aware of, but it can have serious consequences. He said there is evidence that information campaigns like this one do work. Tony Duffin of the Ana Liffey Drug Project said this is “a cocaine campaign for the here and now”. He has previously pointed out there is more sustained use of crack cocaine among Dublin drug users in the last year. There is a cohort of about 40 people in the north inner city that he said he knows of who are regularly using crack. Out of almost 1,300 people who used Merchant’s Quay Ireland’s needle exchange service in the first three months of this year, 242 people reported using crack cocaine. More users smoke the drug, but a smaller number inject it intravenously. Today’s campaign also includes advice for crack users, like avoiding sharing crack pipes, inhaling slowly and ensuring they hold the pipe in the right place so they don’t burn their hands. Minister Byrne said it is important to recognise that drug users are often “going through a torment in their lives”. “Sometimes people with addictions aren’t seen as human beings,” she said. Email “HSE launches new advice campaign as cocaine use returns to Celtic Tiger levels”. Feedback on “HSE launches new advice campaign as cocaine use returns to Celtic Tiger levels”.